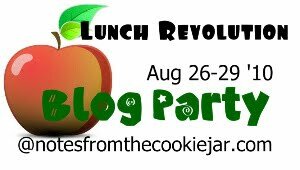 Did I enjoy all of your entries in the blog party!!! Chicken nuggets with a side of ice cream and a pop tart? Pizza with a side of pizza? Chicken nuggets three times a week? I laughed and then I cried. What are we doing to kids in this country? I’m really inspired by all the “bento mamas.” Really terrific recipes and the lunches couldn’t be cuter. I want to do that for my son too, but my bigger wish is that the schools could offer fresh, healthy food so all kids can eat well. I would opt in financially to a system like that so that my son could get good food at school along with the other kids. Then I wouldn’t have to worry about what he is eating at school and there’s be no need to pack (a parent who prefers to pack certainly could). 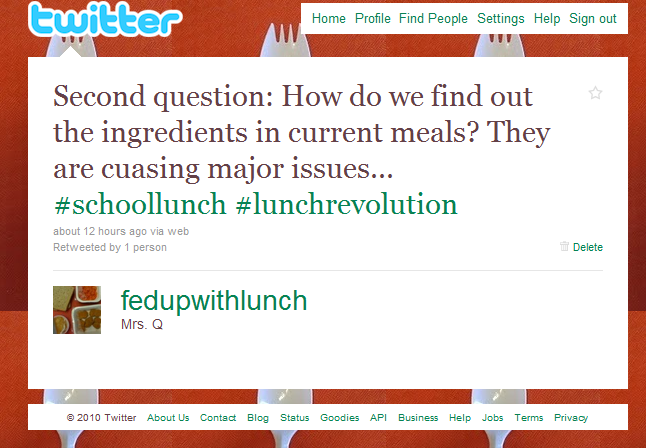 Someone linked up to an article from April: School lunch: This is war. The title made me chuckle (I in no way endorse the article — I just thought the title was funny). But “a war” is a good analogy. I’m in the trenches privately but in a public way. We’re fighting for the health of kids in this country. If we don’t win, they lose. And the price for our society? Health care costs that bankrupt this country. The staggering loss of human potential…. Winner is: #17 decafmom You were lucky number #17 — $50 giftcard from Whole Foods! 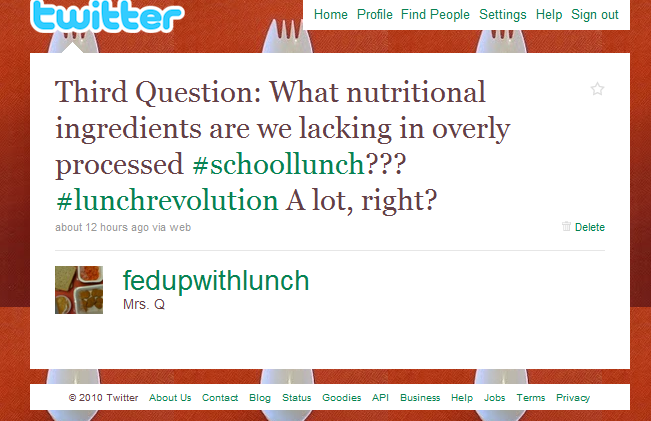 If you are a winner, please email me at fedupwithlunchATgmailDOTcom with your mailing address! Enjoy! Welcome to the Back to School Blog and Twitter party! Do you pack lunch for your kids and what do you pack? What are some of your favorite lunch recipes (kid-friendly or adult-friendly)? What are some great beverages for kids and adults? What is a traditional food item that you have made even more healthy and how did you do it? 2) Link your blog post to the linky widget below (at the very bottom of this post). 3) Come back over the next couple days and review the links of other bloggers (as well as those on Karen’s blog: Notes from a Cookie Jar) and make ONE comment citing THREE things you found interesting. If you can’t find three things you learned from the other blogger’s blogs, please note that. One of the three things can be that you signed Jamie Oliver’s Food Revolution petition for better food in schools. 4) I’ll close the blog party on midnight on Sunday August 29th. You have the entire weekend! Open to: US and Canadian mailing addresses. About the sponsor: We seek out the finest natural and organic foods available, maintain the strictest quality standards in the industry, and have an unshakeable commitment to sustainable agriculture. Add to that the excitement and fun we bring to shopping for groceries, and you start to get a sense of what we’re all about. Oh yeah, we’re a mission-driven company too. If you are interested in learning about our business practices and what makes us tick, check out our Core Values, Quality Standards, Declaration of Interdependence, and more. Around here, we often talk about our mission in terms of Whole Foods – Whole People – Whole Planet. About the sponsor: WaterGeeks is helping turn the global water crisis upside down by empowering consumers with compelling new water consumption choices that embrace both their active lifestyles and their ecological beliefs. 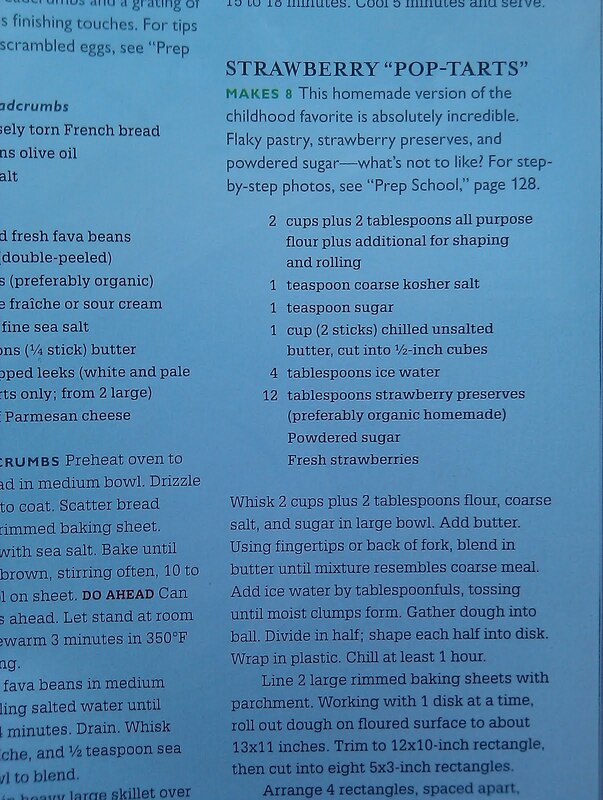 5) My Lunch Box: 50 Recipes for Kids to Take to School! 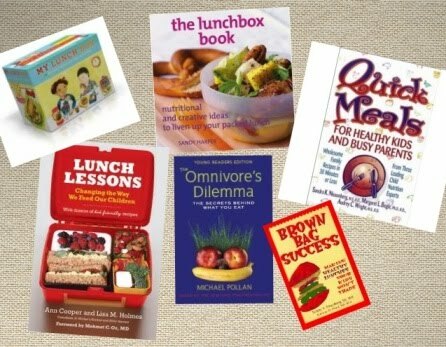 About the sponsor: I’m offering books about how to make better lunches for your family. 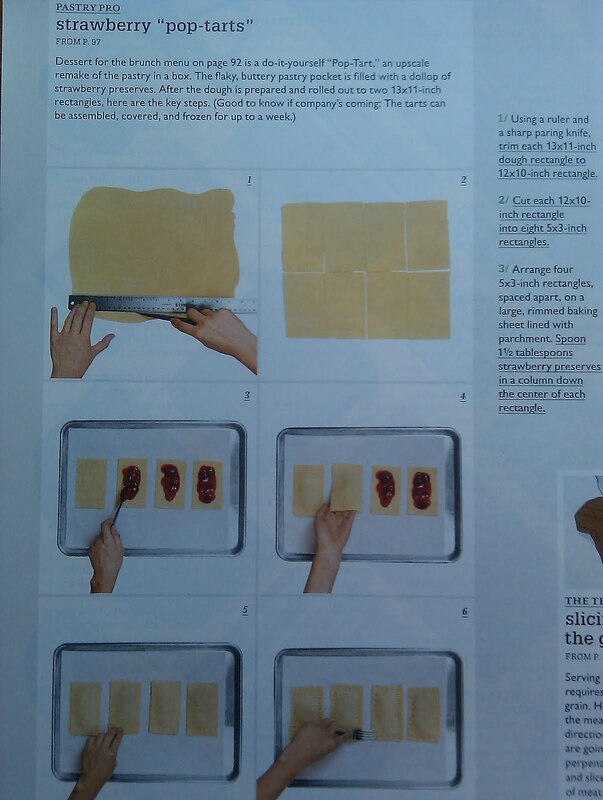 I have read Lunch Lessons and it is terrific. The other books look like ones I should check out. If you check out Notes From a Cookie Jar, you’ll notice right away that she has some major prizes too! A BIG THANKS to her for being organized and helping me coordinate prizes! I hope you will be able to join us this weekend! I can’t wait to read your blogs and see what you think about school lunch! I will select winners at random, but remember to win you must: 1) Write a blog post, take a picture or record a video about school lunch 2) Link it below 3) Comment on this post. 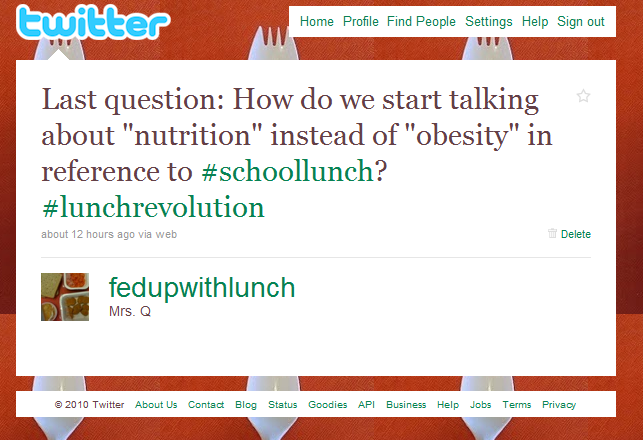 We will be discussing school lunch. I will post discussion questions and feel free to ask your questions too! 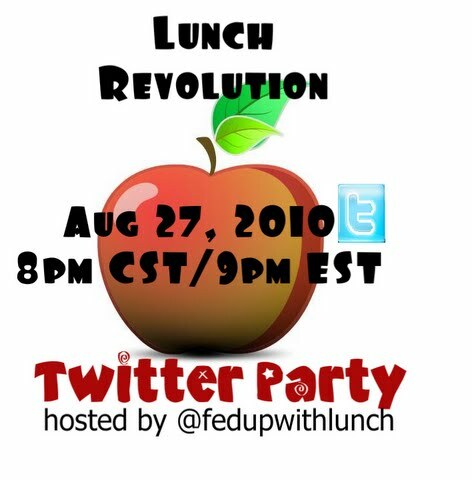 The twitter party is another way for you to connect with people who care about school lunch reform and meet some new folks who you may not have known about before. 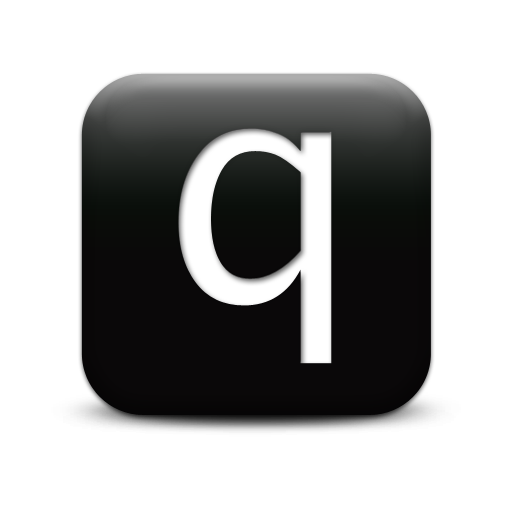 About the sponsor: DesignFaire provides full service consulting, from domain registration, hosting, web design, development, search engine optimization, to training. Our goal is to build compelling, easy-to-use websites. Their process is collaborative and client-centered. Expect an engaging development process that has you in mind. About the sponsor: Sprig Toys, Inc., is an eco-friendly company dedicated to making the best toys the right way. Inspired by our collective desire to keep kids active and the planet healthy, Team Sprig is dedicated to infusing creativity, smart design, quality manufacturing, earth-friendly materials, product satisfaction and responsible business practices into a superior line of fun, kid-powered toys. We help make the world a better place and we get kids off the couch. Prizes to be given out randomly every 15 minutes to those with thought-provoking tweets. It’s my sincere hope that the prizes offered reflect the broad scope of readers who have different interests including parents, teachers, students, nutritionists, bloggers, and foodies from various age groups. I can’t wait to hear all about what you think about school lunch. 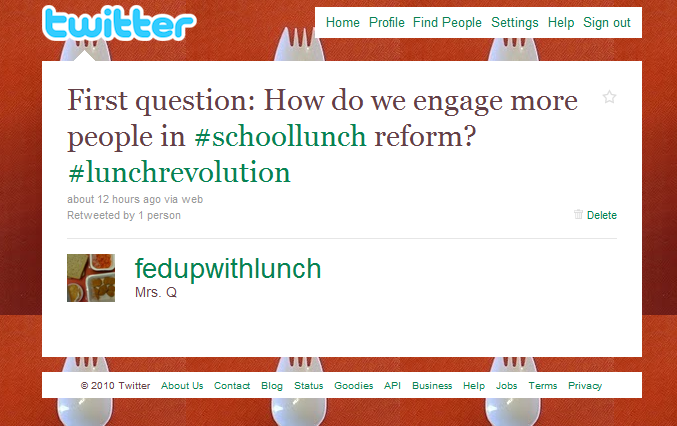 Don’t forget to use one or both of the hashtags #schoollunch or #lunchrevolution so that I can see what you are saying. I want a shirt like that one too! 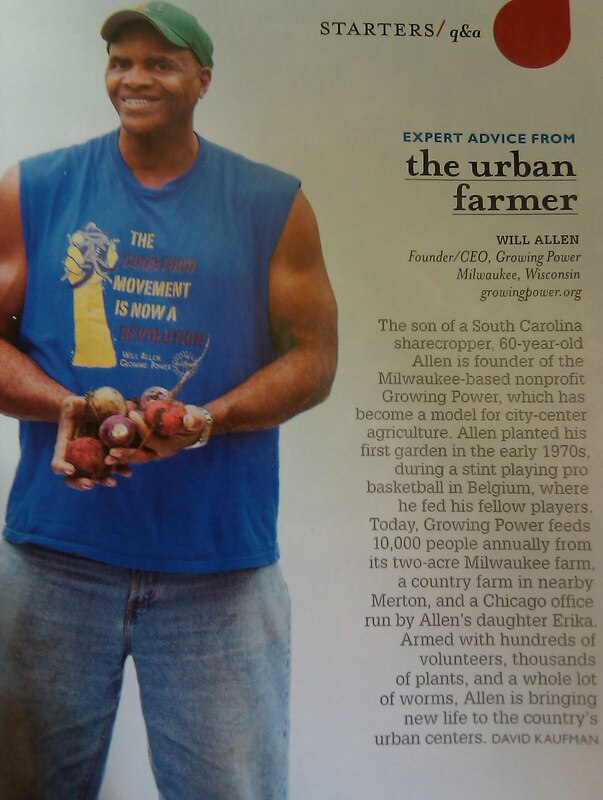 I have only recently learned about urban farming and had never read about Will Allen until I saw this article in Bon Appetit. I read his bio on Wikipedia. 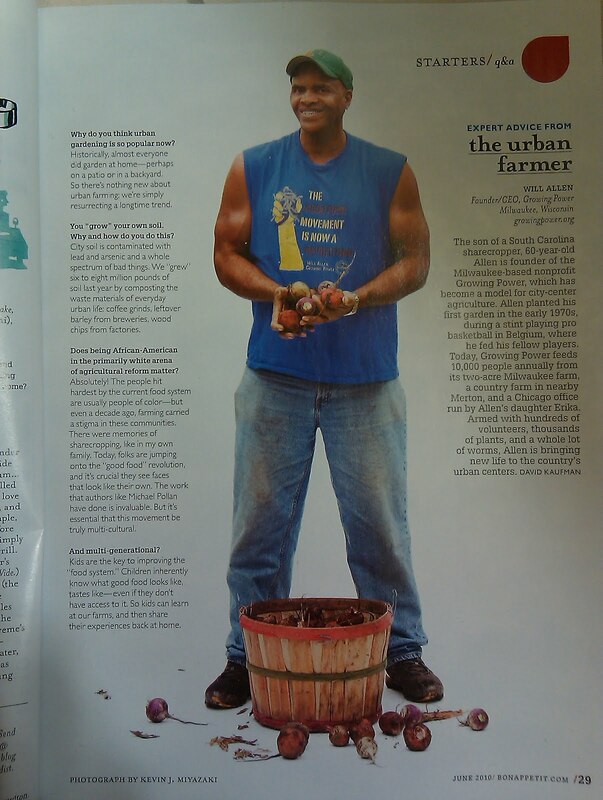 Mr. Allen is an urban farmer and his organization is Growing Power. The MacArthur Foundation awarded him the MacArthur Fellowship (genius grant) in 2008. Mr. Allen’s organization is hosting a conference in September: Growing Power’s National-International Urban & Small Farm Conference. Does anyone just eat one pop-tart when they open the package? 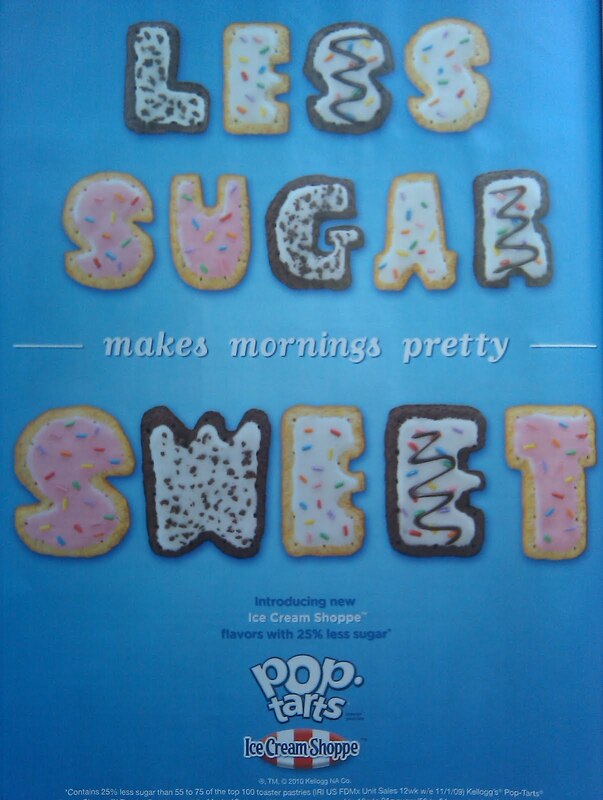 Did you read about how Pop-Tarts World just opened up in NYC’s Time Square? Here’s is a Yahoo! News video that shows viewers the inside of the store and interviews people. The reporter remains pretty much a big fan of the whole operation (yeah for journalistic integrity) and interviews a man who said he ate 12 pop-tarts while hanging out in Pop-Tarts World!! I’ll do that math on that one: 2,400 calories. A day’s worth of calories for many people. Holy 456 grams of carbohydrates! Can you even imagine the blood sugar spike? On the road to diabetes in one day? Another reason to watch the video is that they show a worker making “pop-tart sushi.” Basically they grind up pop-tarts and then roll the bits up in fruit roll-ups! I think I died a little bit inside when I read that. 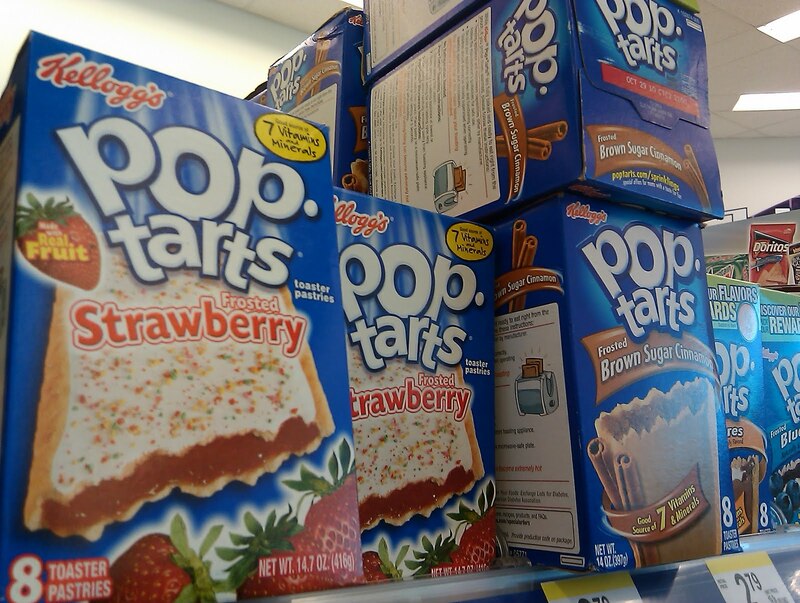 I’m just going to say it: It is irresponsible for a corporation to open up a store like Pop-Tarts World when our country is in a “nutritional free fall” with cancer and obesity reaching epidemic proportions. Better would be free cooking classes using real food for any person that happens to wander past. Take the Pop Tart. Among its tasty ingredients? Gelatin, made from by-products of the meat and leather industries; sodium pyrophosphate, commonly used in household detergents; and Tert-Butylhydroquinone (THBQ), a preservative, also found in household varnishes; three artificial colorants, including Red No. 40, banned in many EU countries because of human health concerns; and, palm oil. The second most-traded vegetable oil in the world, palm oil is found in most cookies, crackers, granola bars, and more. The global warming connection? Ninety-eight percent of palm oil is produced in Malaysia and Indonesia on former forests that have been cleared and burned, releasing tons of greenhouse gases. 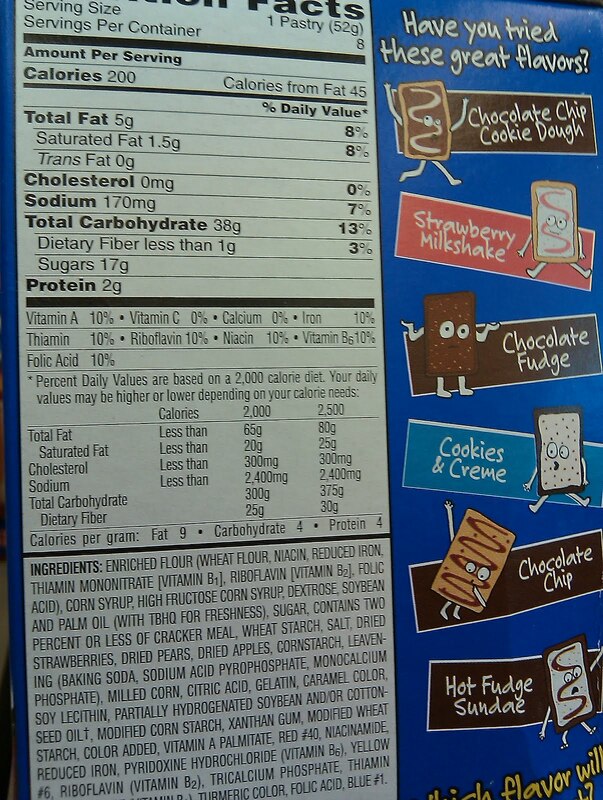 Steer clear of Pop Tarts and their processed food brethren and choose real food. 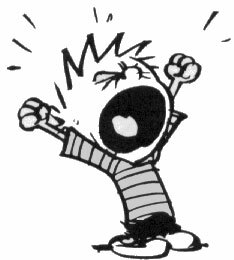 I confronted my husband and told him that he was not allowed to buy another box of pop-tarts. He whined about it so I dragged him to the computer and made him read that paragraph. 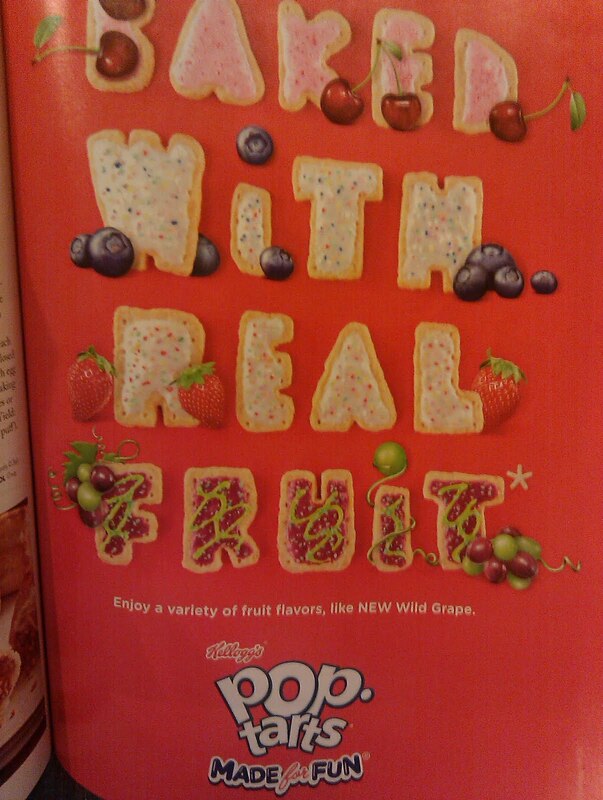 We no longer buy pop-tarts. 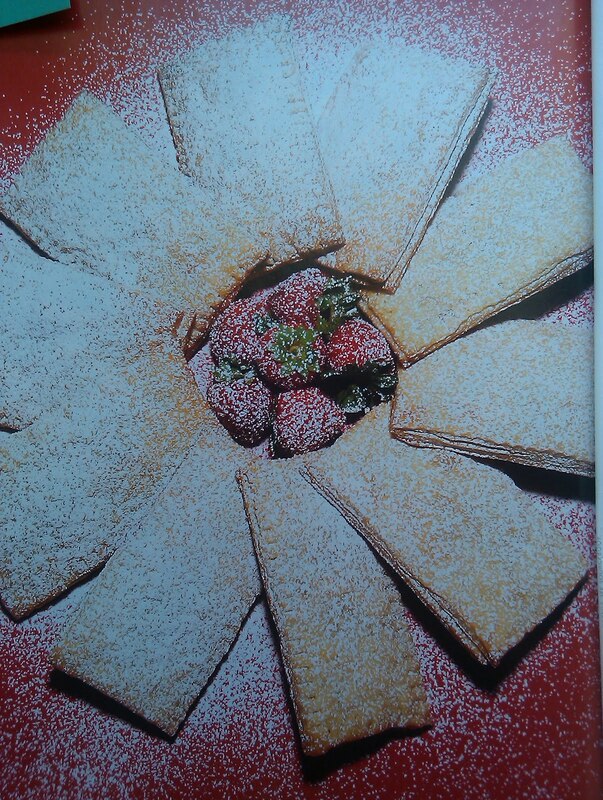 Now THAT is something I want to eat! I’ll be back in school and eating school lunch in just a couple weeks. Frankly, I’m not looking forward to eating the lunches again. I keep hoping that there will be menu changes and that things will be better than the 101 school lunches I ate over the first half of the project. It’s probably optimistic of me to think that the food service companies that provide the meals might have retooled their menus. But considering the media attention being paid to school lunches in general, I remain hopeful that things will be better. Maybe I have to tell myself that (“It will be better, it will be better…”) so that I can feel ok about it. Also I’ve mentioned before that I have a sensitive system. My body has been happy all summer long. Upsetting that balance bothers me a little, but I will survive. When I think about my job, I look on the bright side and think about my students and co-workers. I’m thrilled that I’ll get to see them again and get back into the school routine. I love my work. I work with kids who are needy in many ways. I enjoy helping them and I do believe I make a difference in their lives. I wish I could tell you more about myself, but it will have to suffice that my profession was a deliberate choice. I wanted to do this, I worked hard to get here, and I enjoy most days very much. I love having summers “off” (this summer the blog has kept me very busy so it was not exactly “off”) but I dislike transitions. The transition from the end of the school year to the summer can be especially challenging because getting through the end of the year stuff can be stressful and exhausting. Then suddenly I’m at home listening to the crickets. In late August it’s the opposite. I’m at home, relaxing (and blogging a lot truth be told), and all of a sudden I’m at work, running around setting up my room, getting rosters together, and trying to plan. A year ago the transition in August/September was the most difficult I have ever experienced. I don’t know what caused my anxiety to spike, but knowing that last year was rough is helping me feel prepared for any emotional changes that come with the start of this school year. Another bonus: Autumn is my favorite season. It’s hard not to feel excited by crisp, jean jacket weather. Then kicking leaves, going for comfortable walks without humidity and replacing my sandals with more rugged boots (I’m not a sneaker person, but I love comfy shoes). I enjoy Halloween (last year I wore a ridiculous hat and called it my costume) and eating homemade pumpkin bread. I’m vowing now to go to the pumpkin patch this year with the kid (I didn’t get around to it last year). And did I mention that Thanksgiving is my favorite holiday? The months to come will be some of my most special. Guess what? I was interviewed by Parents magazine for their September issue, which is on newsstands right now! Last week I was at the grocery store and was just about to check out when I saw a September issue of a magazine. I knew my interview in April/May would be coming out soon. I turned around and went straight to the magazine aisle. I found Parents magazine and I noticed on the front that their school lunch article was one of the headlines! I hurriedly flipped to page 219 (what a thick issue!) and found that my quotes were there, in the first paragraph no less! I wanted to grab the other people in the aisle and scream, “YES! !” But I refrained myself because after all I am anonymous. Instead I did a little excited jump because isn’t everyone excited in the magazine aisle?! Mrs. Q, (aka Me! ), was in Parents magazine… What a thrill and what an honor. Check out the article — it’s informative with lots of expert opinions. I will be speaking at the Mayo Clinic’s Center for Innovation’s Transform Symposium 2010 next month. They asked me months ago and I had to accept. I mean, who turns down the Mayo Clinic? We’ve been working out the details so that I can remain anonymous. I told them, “No photo, no video, no problem!” Well, they want to record it… Oh boy. Of course the Mayo Clinic came up with a solution: Second Life. They do various speeches through Second Life already and so it’s easy for them to have an avatar of Mrs. Q “talk” about the project, school lunches, and kids’ nutrition. How brilliant of them — I shouldn’t have expected anything less. Not to mention everyone in the Center for Innovation is exceptionally nice. I have no experience with the virtual world, but planning the presentation has been such fun. If anyone would like to figure out who I am by attending the conference, well, it’s sold out and I’ll be “speaking” through an avatar. How appropriate for the mysterious Mrs. Q.